"Process is important and valuable but it can become dogma in an organization. Process can drive out creativity and problem solving." Do you manage your process? Or your process manages you? I was listening to the "Everyday Innovator" podcast the other day. Richard Banfield and Chad McAllister were discussing the new book Richard has co-authored, called "Product Leadership: How Top Product Managers Launch Awesome Products and Build Successful Teams." One point Richard made specifically resonated with me. Process is important and valuable but it can become dogma in an organization. Process can drive out creativity and problem solving. We employ process without improving the work style. And we fail. Experimentation process fails when a company has a blaming work style. Agile fails when a company has a fixed, 3-year roadmap. Product Management fails when Sales is the only source of requirements. A process couldn't solve anything on its own. It could only magnify. Empower. If there is anything to magnify. If you already talking to your users then a good discovery process could supercharge your efforts. If you already shipping code often then a Continuous Delivery process would speed things up and make them simpler. If you already involving senior stakeholders into the discovery efforts, then the Design Sprint could shorten the cycle and deliver learning quicker. A process should help you do better something you already do. A process should help you manage better. Do you manage your process? Or your process manages you? Make a very simple test. Next time you are about to do something, execute an activity, like drop a meeting or create a document or ask your colleague - think why you do that? Why? Because there will be a recognizable value as the result of an activity or just because your process tells you to do that? If your answer is the later - reconsider your process and focus on improving your work style. Trello is not enough - let's use Jira. Because Jira gives more ways to tinker with workflows and boards, and statuses. While we still don't read what's written there. Skype is bad - Slack, Slack, Slack! Because you can't write bots for Skype. We don't want to talk to people, robots are much better. Email and phone so old fashion - we need a CRM. We still not gonna talk to our customers! Tools should be amplifiers of our success. 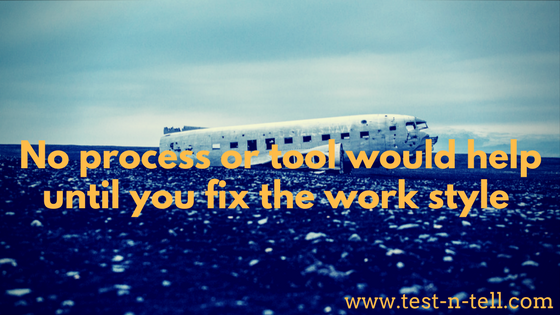 We should not be using tools to fix shortcomings. If you have a problem, a tool is not going to solve it. Tools should be used in areas where we are already doing well and a tool can make it even better. Tools should 10X what is good – our strengths – and make them great.